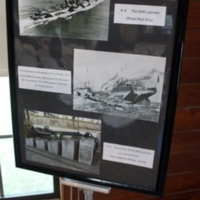 Three stands displaying six photographs on stage at the Geneva Community Center in Geneva, Florida. 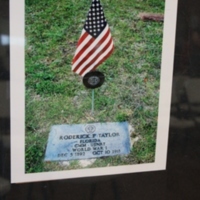 The first stand has a photograph of the headstone of Roderick Perry Taylor and an American flag. 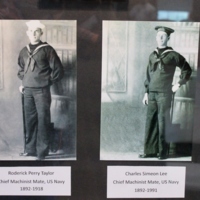 The second stand has photographs of Taylor and Charles Simeon Lee in their Navy uniforms. 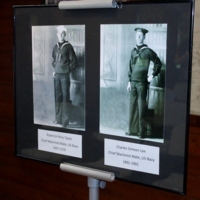 The third stand has photographs of the R.M.S. Leinster at sea, a contemporary drawing of the sinking of the ship, and the ship's anchor. Original color photographs: RICHES, University of Central Florida, Orlando, Florida. Cravero, Geoffrey. 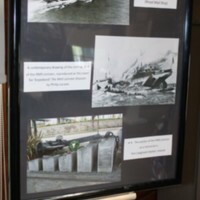 “Memorial Photographs Displayed.” RICHES of Central Florida accessed April 21, 2019, https://richesmi.cah.ucf.edu/omeka/items/show/10419.